2.5 cups water for cooking the rice. Rinse the rice and peanuts first. Add 2.5 cups water. Soak both rice and peanuts for 20 to 25 mins. Add salt. Keep on the stove top and cook the rice. If required, then you can add some more water while cooking the rice. Boil it and keep it at low flame till the rice grains are cooked well. Cover and keep it aside. Soak 1 tbsp tightly packed tamarind in ½ or ⅔ cup warm water for 25 to 30 mins. Later squeeze and extract the tamarind pulp. In a pressure cooker, add rinsed tuvar dal/pigeon pea lentils, turmeric powder and 2 to 2.5 cups water. Pressure cook for 8 to 9 whistles or till the dal is cooked soft. Once the pressure settles down on its own, mash the dal and keep aside. In another pan, take the chopped veggies and ¼ tsp salt. Pour 2 cups water and stir. Cover and allow the veggies to cook till they are cooked. Now in the cooker with the mashed dal, add the cooked rice and peanuts. Then add the cooked vegetables along with its stock. Stir lightly. Add 1 cup of water. Add tamarind pulp. Mix everything taking care the rice grains do not break. 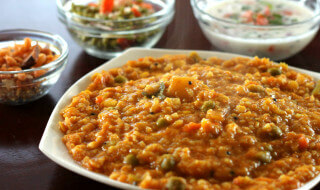 Now in another pan or bowl, take the 3 tbsp bisi bele bath masala and 1 cup water. Stir very well. The masala tend to stick to the back of the spoon while stirring, so scrape it off and add to the mixture. Now add this bisi bele bath + water mixture in the cooker. Add desiccated coconut. add 1 tsp salt or as required. stir well. Keep the cooker without the lid on the stove top and simmer on a low flame for about 20 to 25 mins. Add more water if required. Keep on stirring often. The raw aroma of the tamarind has to go away and all the flavors should be blended well. Cover and keep aside once done. In another pan or the tadka/tempering pan, heat ghee or oil first. Crackle the mustard seeds and then temper the curry leaves, marathi moggu, dry red chilies, cashews and asafoetida till the dry red chilies change color and the cashews turn a light golden. Don’t burn the spices. Pour this tempering in the prepared bisi bele bath. Stir and cover the cooker with its lid for about 5 mins, so that the tempering flavors infuse in the bisi bele bath. Later serve the bisi bele bath with potato or banana chips/wafers or fried papads. While serving bisi bele bath you can top with some ghee if you prefer. 4 Healthy Snacks Recipes with Brown Bread to Lookout For!